We ship for FREE within the continental U.S. If you have an Alaska, Hawaii, or International shipping address, please contact us for a shipping quote. Trailers can be shipped broken down via truck to your home or business, or you may pick it up fully assembled at our Huron, Ohio manufacturing facility (see our Contact Us page for a map and directions). 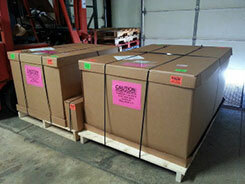 Trailers are shipped on a pallet with the axle, fenders, tongue, and wheels securely packaged inside. Assembly is simple; complete instructions are included. Tracking information for your shipment will be provided. 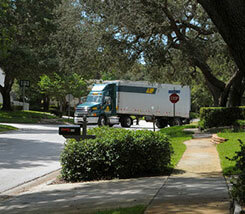 The truck line will deliver your trailer to the shipping address provided. The driver may need the assistance of two people to offload the up to 350 lb. crate. Normally, two people can unload the crate. In the event you cannot give the driver assistance, selecting the lift gate option will be required when you order. The additional cost is $110. Choose your trailer in the color and size you prefer, choose your accessories, and get ready to take what you want where you want it! 32" x 43.5" x 18"
32" x 43.5" x 22"
40" x 60" x 22"
IMPORTANT: If you are unable to assist the delivery truck driver with the offloading of your trailer (crate may weigh up to 350 lbs. 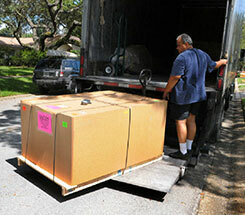 ; two people can normally unload the crate), your delivery will require the addition of a lift gate option. 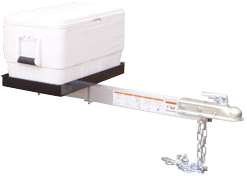 Your small cargo trailer purchase comes standard with a 1 7/8" coupler. If you need to upgrade to a 2" coupler, you can buy that option here. Cooler tray mounts on trailer tongue. 13.5" x 23". Fits most common size coolers. Side holes provide convenient tie-down points to secure cooler. Includes stainless steel mounting hardware. 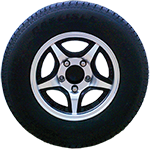 Full sized spare 175/80/R13 steel belted radial tire. Aluminum wheel. Spare tire tongue mount constructed from heavy aluminum material. Includes stainless steel mounting hardware and lug nuts. All content and images are © their respective owners; all rights are reserved. Background map image courtesy USGS. Map services and data are available from the U.S. Geological Survey, National Geospatial Program. We recommend the Firefox Web browser or other standards-compliant browsers.